The Bellagio has a gorgeous Dale Chihuly ceiling that always announces spring, and free fountain shows that delight, but the Bellagio also has their lush and floral Spring display now open. The four garden areas include 10 potted olive trees, each more than 100 years old. Over the years, these ancient trees have been carefully sculptured into oversized bonsai presentations. There's a 15-foot-tall flower pot, overflowing with rainbow-hued blooms. A beautiful spring butterfly rests atop the oversized pot while a towering 28-foot spade stands nearby. Overhead, bumblebees made of preserved sunflowers pause mid-flight in their search for nectar. 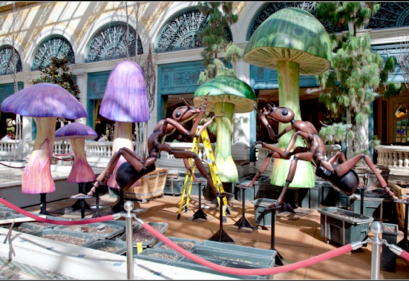 But for kids, and those with a sense of whimsy, there are large-scale bronze sculptural ants by American artist Susan P. Cochran, who created a seven-member colony. The press release talks about how it represents the ideals of cooperation and teamwork, but really, what's a garden without some ants? And these sounds charming. Resting below two towering yellow jonquils, a queen ant allows guests to climb onto her back for a unique photo opportunity. The stunning 8,500-pound queen provides an ideal vantage point for viewing an exhibit of botanical snails and bumblebees as well as brightly colored tulips, poppies, daisies, mums and daffodils. The autumn displays have been breathtaking, and we look forward to the chance to experience Spring in the Bellagio in Las Vegas. 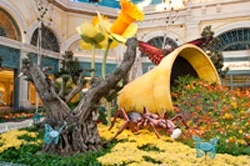 Access to the spring exhibit within Bellagio’s Conservatory & Botanical Gardens is complimentary to the public and will be on display through May 9. © 2019 Susan P. Cochran, all rights reserved.